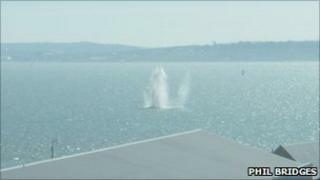 A controlled explosion has been carried out after six World War II bombs were washed up on a Hampshire beach. Coastguards and police were alerted to the devices, which were originally thought to be from World War I, at Calshot on Tuesday night. The bombs were then covered by the tide and a 1,000m (3,280ft) exclusion zone was set up around the site, between the coastwatch tower and the car park. The bombs were destroyed at about 1300 GMT. The devices were thought to have been dredged up by fishing nets.